This week's BCS ranking came out a few hours ago. The commentators on ESPN were all agreed that Auburn should be #2 this week, given the performance of the Oregon Ducks yesterday against USC. A couple of the guys pointed out that Auburn's inconsistency in play has them doubting the overall quality of the Tigers and whether Auburn can win out in its remaining games. 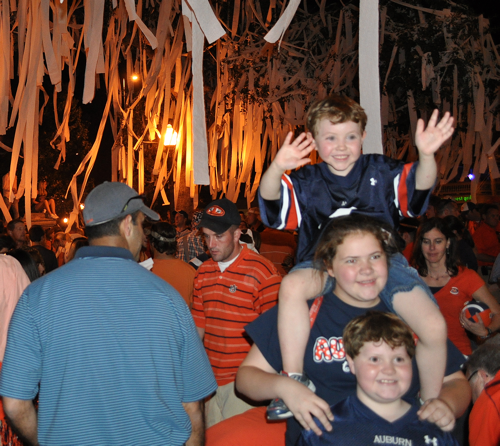 They did point out though that Auburn is in control of its BCS destiny and if the Tigers continue to win, an invitation to the national championship game is ours. 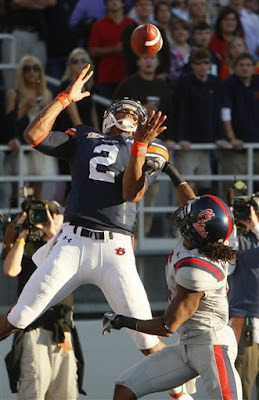 When the official rankings were unveiled, Auburn had indeed slipped to #2. ... this is a practical world and I can count only on what I earn. I imagine that Gene Chizik and the rest of the coaching staff are reminding the Tigers of these important points from The Auburn Creed. 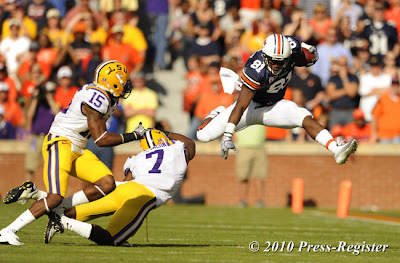 I believe that the Tigers will continue their efforts and will do what it takes to win. And we fans will continue to lift our Tigers with an outpouring of spirit and unwavering support. 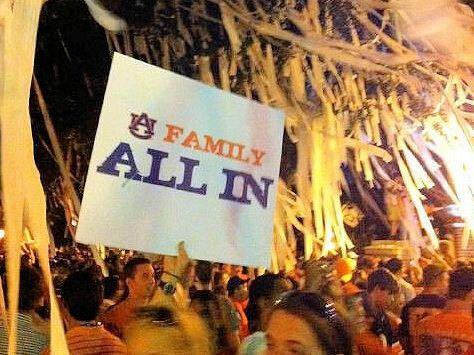 We are Auburn Family and We are All In. A creed is a statement of belief relating to how one should approach life. 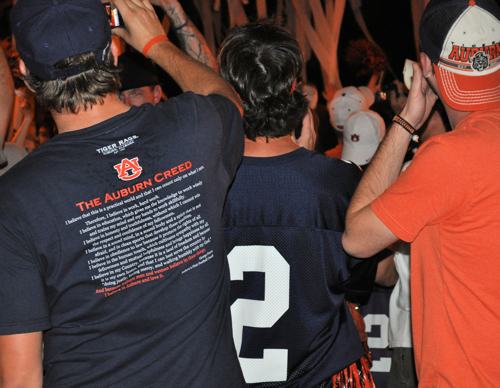 But while The Auburn Creed is Auburn's creed, and Auburn men and Auburn women have found guidance in it for their lives since its writing by George Petrie in 1945, the principles it embodies are ones that we should hope all of our fellow men and women from all colleges, all walks of life, will embrace. In 2009, a young man playing ball for the Ole Miss Rebels reflected very well The Auburn Creed's endorsement of sympathy for those around us and helpfulness to those in need. Auburn Tigers Zac Etheridge and Antonio Coleman collided while attempting to tackle Rodney Scott, an Ole Miss running back. In the moments after the collision, Etheridge lay motionless atop Scott. Scott realized that something serious was wrong and lay patiently until medical staff could safely lift Etheridge away. Later, the severity of Etheridge's condition was revealed - along with a realization of how catastrophic the result could have been if Scott had attempted to move Etheridge himself. I - as does the Auburn Family as a whole, I am sure - commend Rodney Scott for his quick thinking and caring spirit, for his providing a fine example of The Auburn Creed's applicability to real life. This video from ESPN is a touching account of the event that November day and the bond that has grown between Etheridge and Scott as a result of chance. 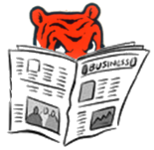 A Paw on the Media: Kickin' It! 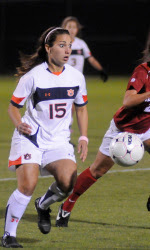 While many of us, and probably most of us, were focused on the football squad's pending game against Ole Miss, Auburn women's soccer team clinched the SEC western division championship on Friday in a 2-1 overtime victory over Alabama. Victory equals one aggressive and talented quarterback on the field leading a strong offensive line plus a couple of excellent running backs plus wide receivers working magic with their hands plus a defense bottling up the opponent's own offense. 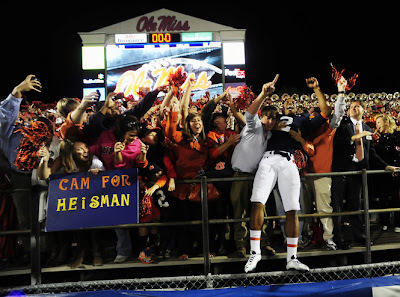 Or, more succinctly, victory = 51-31 over Ole Miss. It looks like the "trap game" was poorly baited ... or maybe the trap wasn't big enough to contain all of the talent and motivation on Auburn's side of the ball. They naysayers who discounted the magic of the Auburn Tigers in the past few weeks are shown once more as underestimating the commitment that the players have to each other, to their alma, and to the game ... to stepping up and doing what must be done to win! Can anyone think of a good reason why ESPN or any of the networks would not want to broadcast the Georgia game? Okay, Georgia has not had a stellar year, but so what? The Tiger's will make up for it! Josh Bynes: Over the Top! 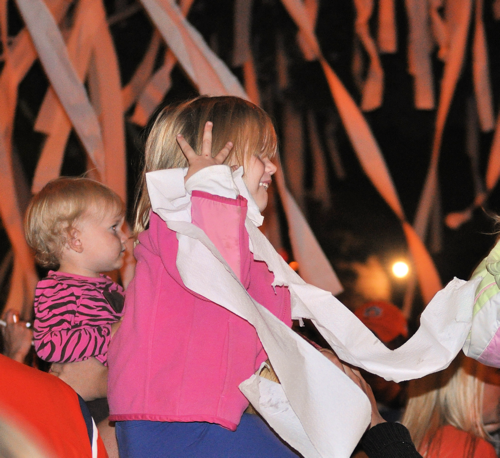 Auburn is the Loveliest Village on the Plains ... and life is lovely on its gridiron. Cam Newton, Receiver: TOUCHDOWN AUBURN! Filming for ESPNU's "Road Show" program. It's great ... to be ... an Au-burn Ti-ger! Don't miss the Blue Man just to the Orange Man's right! The Auburn Tigers certainly had a spirit that wasn't afraid when LSU rolled into town! 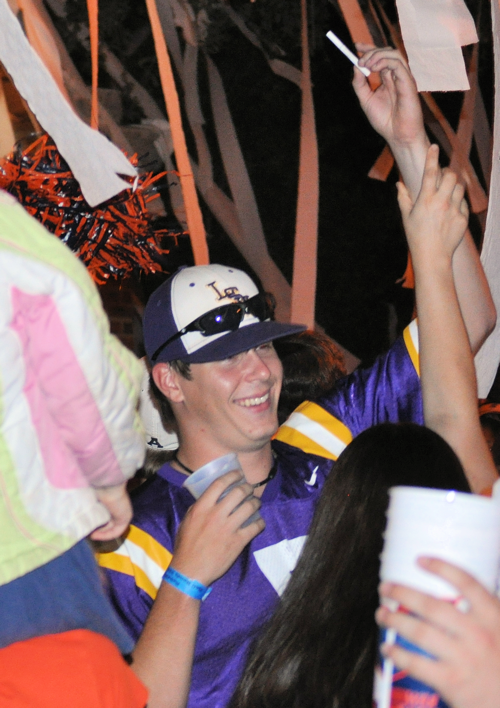 This LSU fan looks like he's a good sport and appreciates the effort of his team despite the loss to Auburn. Cam Newton has made a difference I can believe in! A Paw on the Media: "Auburn is the Right One"
Mark Schlabach at ESPN thinks that the BCS got the #1 ranking right this week. "I know Oregon's high-scoring offense and fast athletes leave you shaking your head with amazement each and every week, but Auburn has accomplished more than any other team heading into the final month of the college football season." Auburn is ranked #1 in the BCS standings released today, a first for the Auburn program since the inception of the Bowl Championship Series! I am very happy for ... and proud of ... the players and coaches of the 2010 Auburn Tigers! 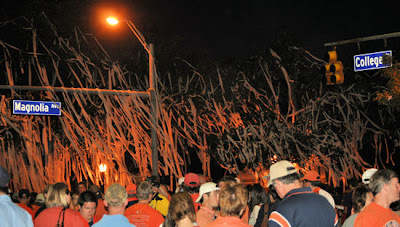 ... not to mention all of the players, coaches, and others in previous years who helped build great traditions in and around the football program at Auburn! 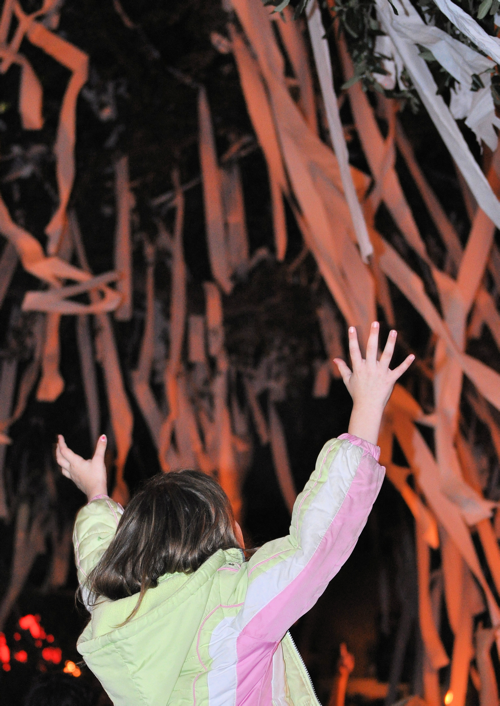 "I mean, seriously, what other conclusion could be drawn here in the cool of this early October evening in Alabama? It’s one thing to roll up 60 points on UCLA, as Oregon did so impressively on Thursday evening. But UCLA’s defense was ranked No. 65 out of 120 Division I-A teams. Its rushing defense was ranked No. 92. 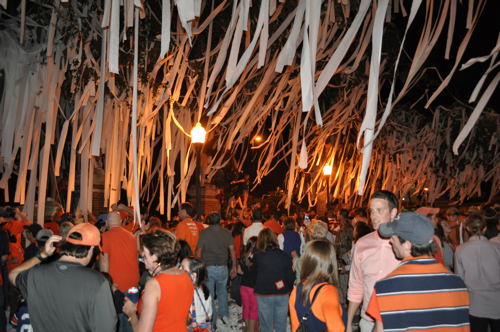 "Auburn, conversely, faced the nation’s No. 6 defense against the run (83.6 ypg) and simply shredded it for 440 yards rushing and 526 total yards on the way to a 24-17 victory over previously undefeated LSU. "... [I]f the team I saw on Saturday keeps showing up, and if Cameron Newton keeps this amazing string of performances going, I don’t see how you can bet against Auburn. This is the nation’s best team with the nation’s best player. They proved it again on Saturday." In case you couldn't see the game ... and in case you haven't found these already ... al.com has video highlights from the LSU game. I think Auburn is the easy pick for No. 1 at the moment based on quality victories: The Tigers have beaten five FBS teams with winning records (compared to one for Oregon, for instance). 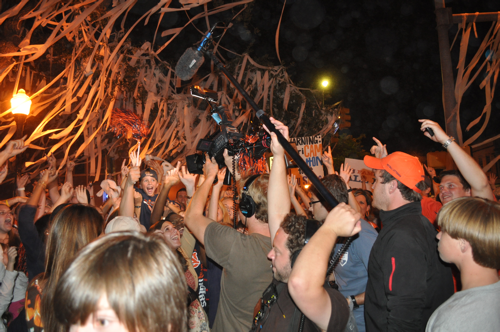 ESPNU's Road Trip was in Auburn yesterday. I spoke with the host and a camera man. 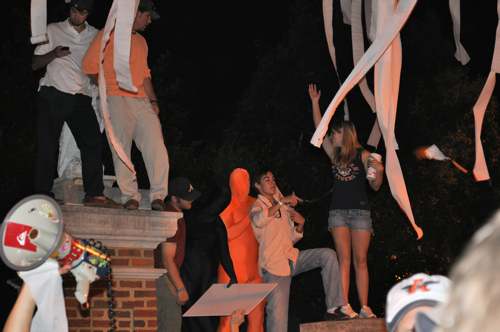 The host said that footage from Toomer's Corner should be on the Road Trip episode to air on ESPNU this coming Wednesday. 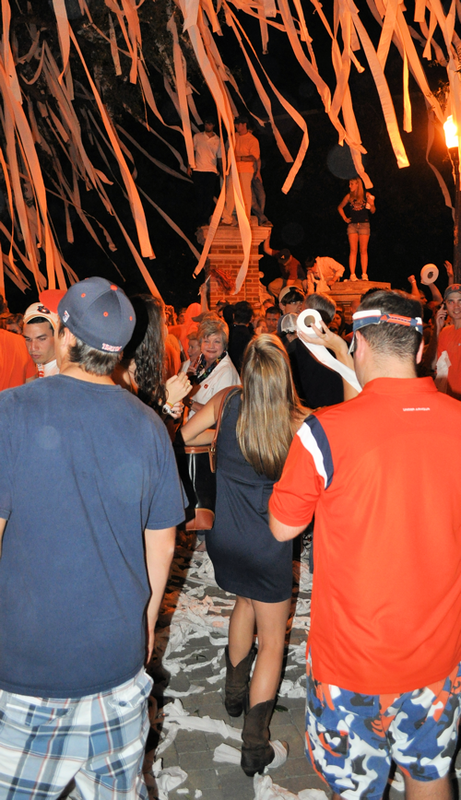 Video: Rolling Toomer's after the Victory over LSU! 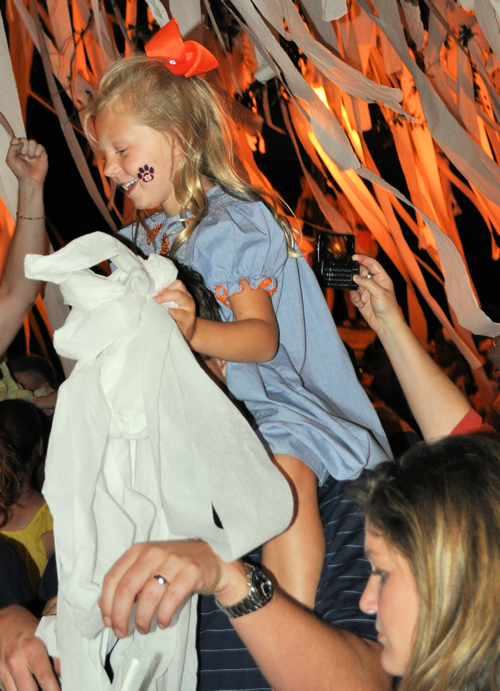 The bigger the win, the better the party at Toomer's Corner! 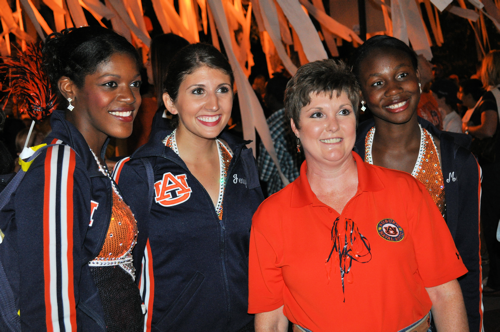 I shot these videos while savoring the victory with oh-so-many of my Auburn Family members! The Auburn Tigers are now 8-0 this season, with a 5-0 record in the SEC, after their spectacular win against LSU yesterday! al.com reports this morning that Auburn has moved up to #3 in the Coaches poll! What a ride this season has been ... so far! And we still have four regular season games to go! Wes Byrum became Auburn's leading scorer during the LSU game. A field goal put him at 315 points in his four-year career. Auburn claimed another Top 10 win when it beat sixth-ranked LSU. The Tigers have 16 wins over Top 10 teams since 2001. Auburn is 8-0 for the eighth time in school history. 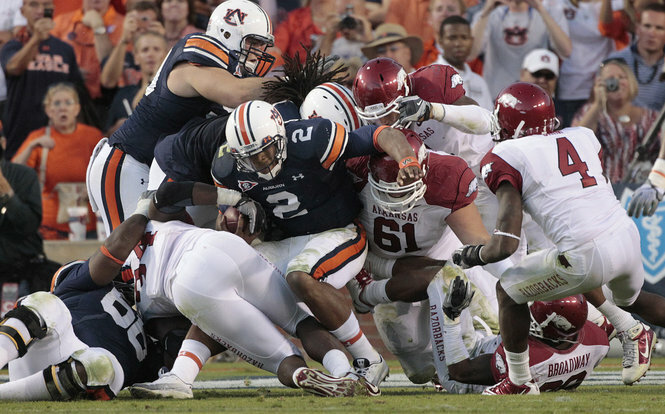 Auburn's 440 yards rushing were the most ever in an SEC game and the fifth most in school history. The Tigers' 86 yards passing was the fewest in an SEC victory since beating Mississippi State 16-14 in 2001. 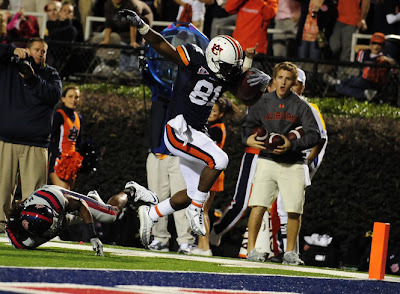 Newton has five of Auburn's Top 50 rushing games in history, though he's played in just eight games. Newton's 14 rushing touchdowns are three shy of the school record. 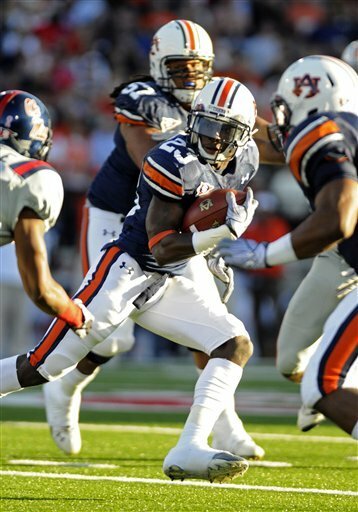 Darvin Adams had three catches for 33 yards to move to 10th in all-time yardage for an Auburn receiver. He has 1,467 yards. It looks like the media bandwagon continues to roll. The SEC has announced that the Ole Miss game will be broadcast on ESPN2 at 6:00pm on October 30th. As I've said before, I think someone will pick up the Georgia game. If so, Auburn will be on TV for 11 of its 12 games. I can't imagine anyone picking up the Chattanooga game but who knows? If the eagle keeps flying and the tiger keeps prowling, maybe someone will broadcast even that game. "If everyone knows what your one-man band of an offense is going to do and he does it anyway, anything's possible. "If your defense can surrender a jillion yards and a million points and never give up, anything's possible." "Chizik and his team are making themselves right at home out there. Ringling Brothers has got nothing on the Tigers. They're a high-wire act without a net. They're the greatest show on earth, dirt or turf. 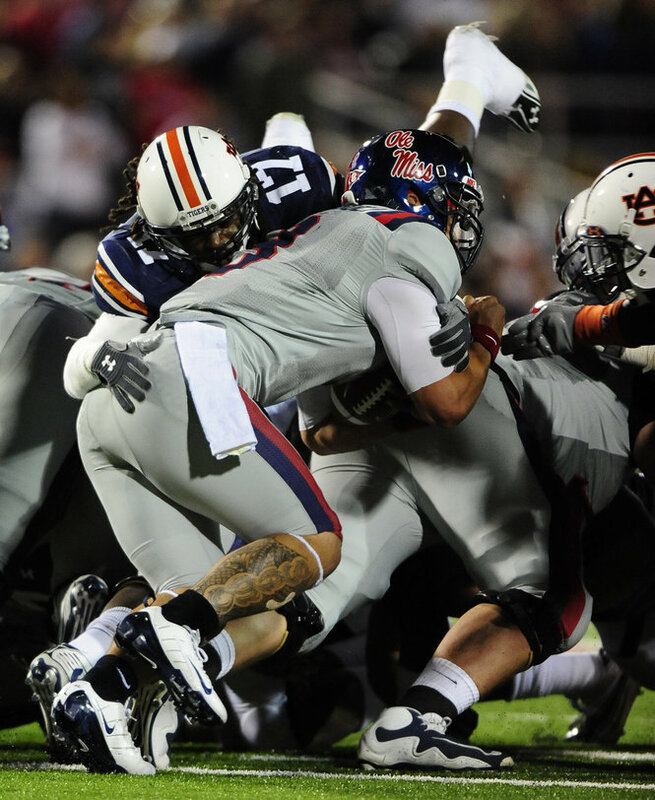 In its game against Arkansas yesterday, Auburn put together its best four quarters of play of the season so far. The Tiger defense was not as inspired as the offense - at least not until the 4th quarter - but everyone on the team did what it took to put another win in the books. 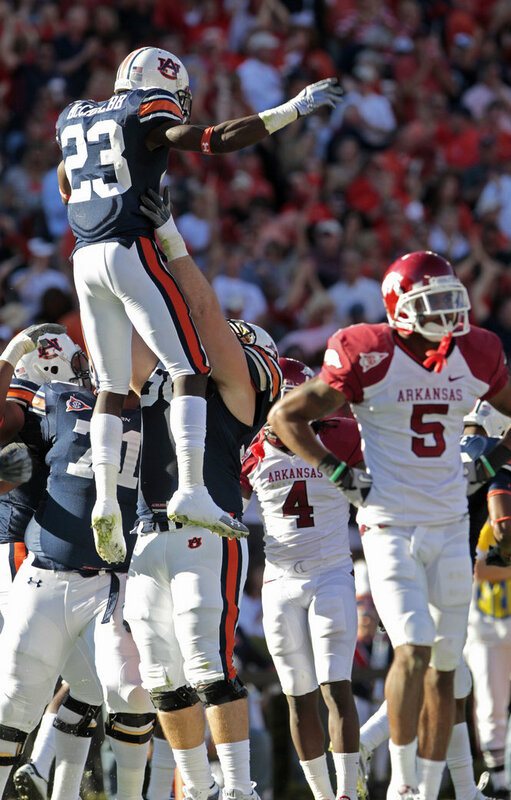 Auburn's and Arkansas' efforts made for one of the best games I've watched in a long time. I like watching solid game-playing by both teams in a game. Match-ups where one team completely dominates the other aren't nearly as much fun. That they put up the most points (combined) of any SEC game without overtime testifies to just how much of a shootout this game was. Even if Auburn had lost, I would have been proud of the Tigers' efforts and would still acknowledge that I watched an amazing game. Cam Newton continues to shine and is definitely doing the lion's share of the work on offense. However, one cannot dismiss the efforts of other offensive players like Adams, Fannin, Dyer and Blake. Some Razorback fans are complaining about the controversial calls confirming a touchdown by Auburn and a fumble by Arkansas (see the fan comments here for a sampling). Both cases were judgement calls and, unfortunately, there wasn't any clear evidence in-game that the calls were wrong. If there had been, the calls would have been reversed. Others might argue that Auburn may not have won if Arkansas had not turned over the ball three times in the 4th quarter. My response: games are decided by what happens on the field and what happens on the field reflects how well each team is taking care of business. By turning over the ball three times, Arkansas did not take care of business. By making the interceptions and recovering the fumble (and eventually scoring), Auburn did. NorthEscambia.com reports on Auburn's eagles visiting 500 fifth grade children in Escambia County. The visit was part of the Progressive Agriculture Safety Days program hosted at the Auburn Experiment Center in Brewton. The Southeastern Raptor Center at Auburn University put on the "Birds of Prey" show for the kids. 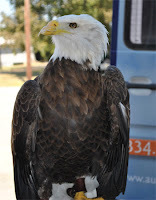 The show included owls, falcons and hawks along with the eagles Spirit and Nova. Just a day after announcing it would televise the Auburn-Arkansas game, CBS Sports announced today that it will also carry the LSU game on October 23rd at 2:30pm. I'm still expecting one of the networks to pick up the Georgia game, due to the intense rivalry between Auburn and Georgia -- even with Georgia not having as good a year as Auburn. 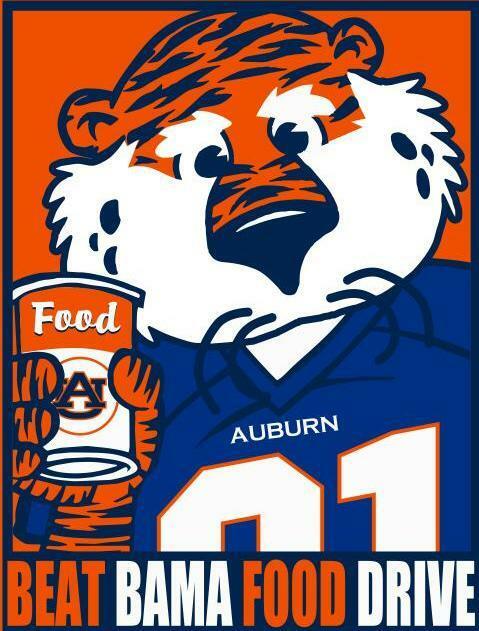 The annual Beat Bama Food Drive kicks off today! The event is a friendly competition between Auburn University, the University of Alabama, and the East Alabama and West Alabama Food Banks. 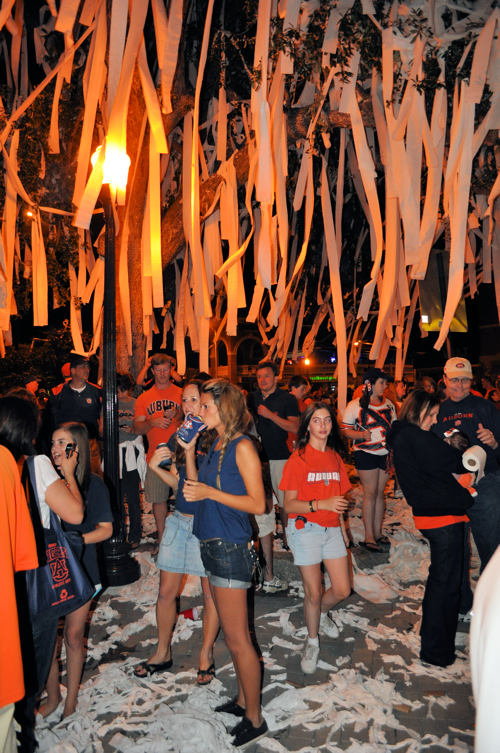 At Auburn, the event is sponsored by the Student Government Association; at Alabama, by the Community Service Center. Auburn has won 9 of the past 14 food drives. 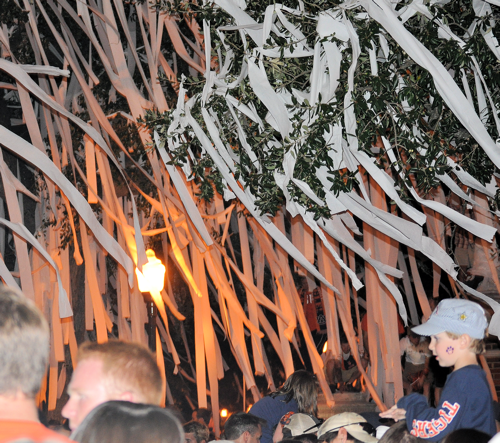 However, Alabama has won the last 3, with Auburn's last victory in 2006. The winner of the drive will be announced at the Iron Bowl game. 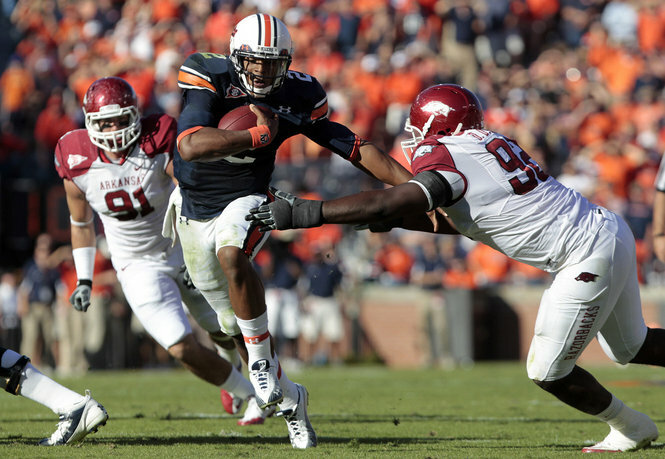 Auburn University announced today that CBS will broadcast the Auburn-Arkansas game on October 16th. The game will be the first carried by CBS this year but marks the 7th appearance of the Tigers on television this season. 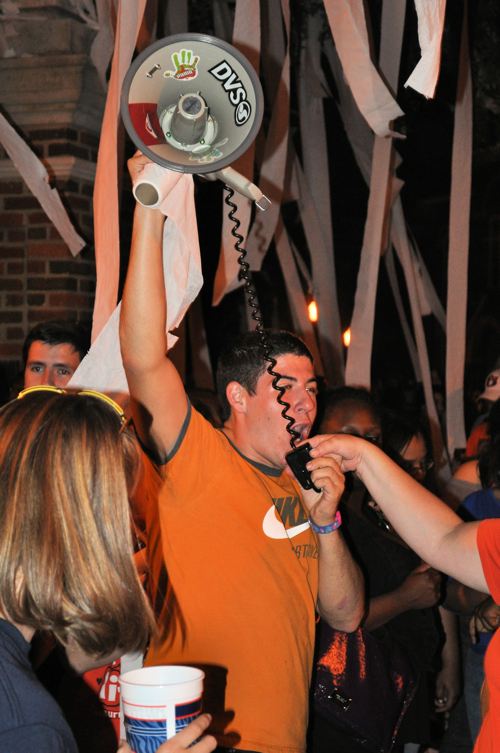 Auburn is slated for at least one more television appearance: the Iron Bowl. 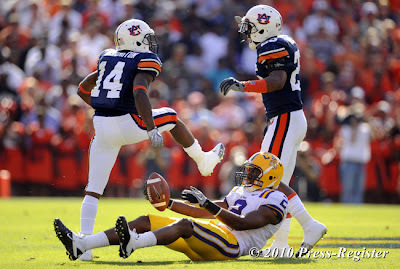 However, I suspect the LSU will be televised ... and perhaps the Georgia game due claim as the South's longest running rivalry. This coming Saturday will mark the first time that both Auburn and Arkansas are ranked nationally going into the game. 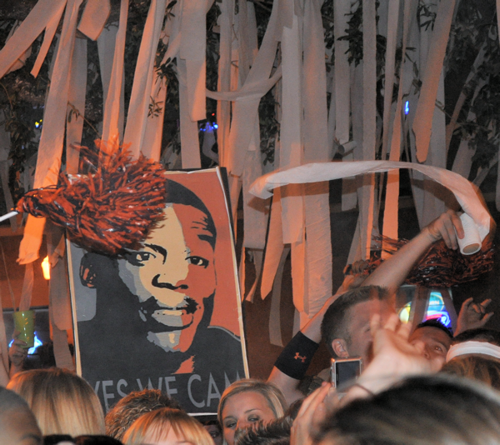 Auburn is ranked #7 in this week's AP and USA Today polls. Arkansas is ranked #12 in the AP poll and #13 in the USA Today poll. 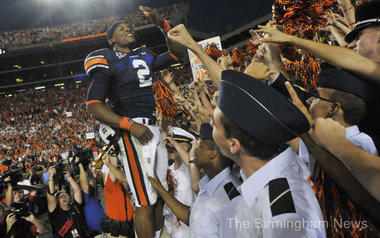 After the Tigers win against Kentucky yesterday, Auburn has moved up to #7 in both the AP and USA Today football polls. Once again, Auburn's performance was mixed - at times showing great skill and talent, at others letting Kentucky have its way. I still believe the players are improving each week although they obviously have need some fine-tuning and a little work on the basics. Although it's human nature to want our team to go out and subject every team we play to a beatdown, I'll take a close, messy, or even ugly win instead of a loss every time! Sani-Freeze, better known as "The Flush"